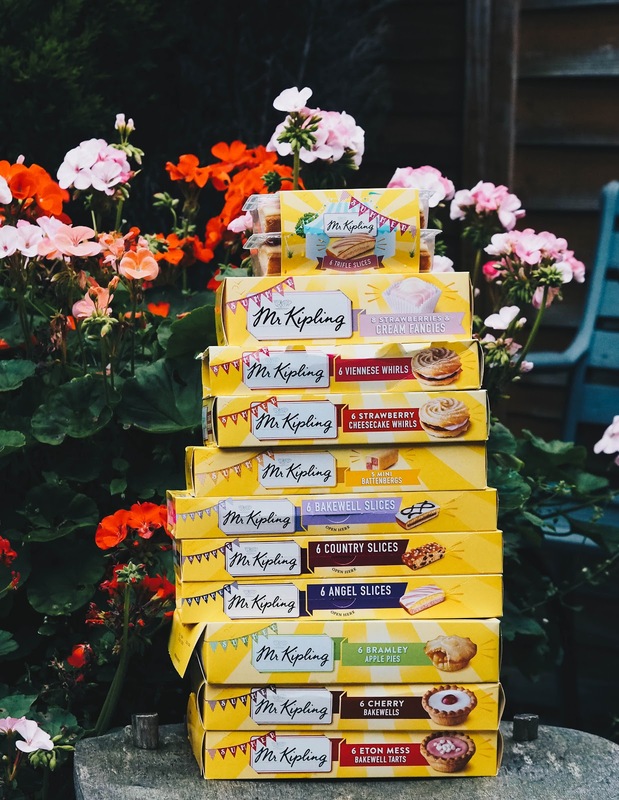 We are massive Mr Kipling fans in this house and they have featured on this blog before a while back. It was to no surprise that I would jump at the chance of working with them again, so that's exactly what I did when they got in touch about their new summer campaign. 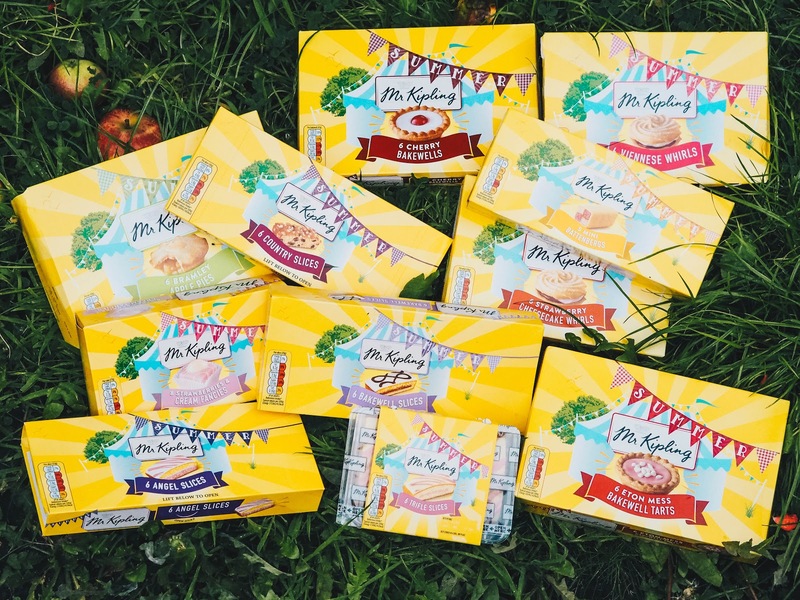 The nation's favourite Mr Kipling cakes have had a summer makeover and are perfect for adding to the afternoon tea table or including in those summer picnic baskets. Even though the sun seems to have vanished and leaves are already falling off the trees, it's still nice enough outside to spend time with friends and family. The summer range has taken some of the old classics and made the packaging look a bit more summer-esque; in vibrant yellow boxes with cute bunting titled SUMMER. There's also 4 new limited edition cakes to the range, which you can read more about below. NEW Eton Mess Bakewell Tarts are a seasonal take on the classic, Cherry Bakewell. I'd say these are a complete upgrade and very delicious. Then there's the NEW Trifle Slices - made with raspberry flavoured mallow and a custard based topping. Definitely one of my favourites that I have tried! Next are the NEW Strawberry Cheesecake Whirls - very similar to the classic Vienesse Whirl, but just a whole lot sweeter with cheesecake flavoured cream and strawberry jam filling. Finally, they have released the NEW Strawberries & Cream Fancies - an absolute classic, except they are all pink and strawberry and cream flavoured! The rest of the range includes classic favourites of; Mini Battenbergs, Bramley Apple Pies, Country Slices, Bakewell Slices, Vienesse Whirls, Cherry Bakewells and Angel Slices. 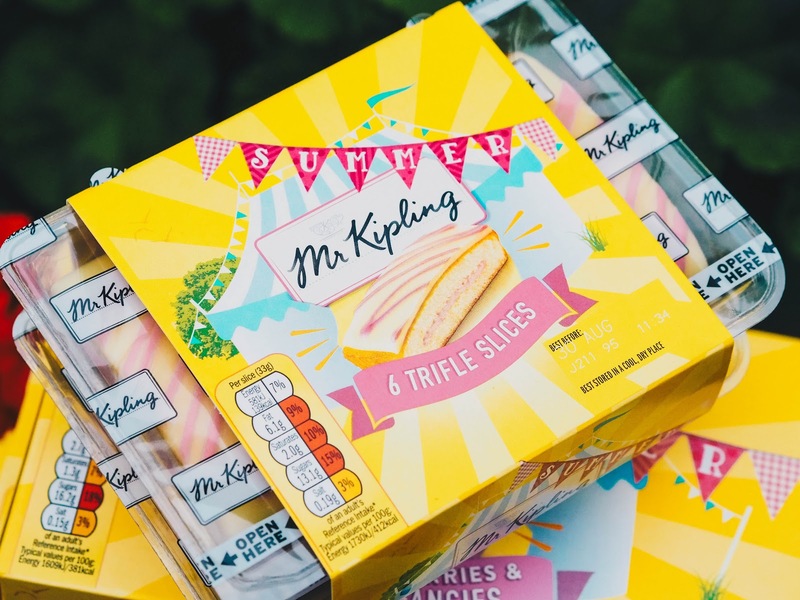 The limited edition Mr Kipling summer range is available in all major supermarkets until mid/late September for £1 a box, but they are kindly giving away a random selection of the summer range AND a super cute (and huge!) cherry bakewell inflatable to one lucky person! To enter, all you have to do is comment on this post what your favourite cake is and enter the form below! Giveaway ends 11.09.2017 and the winner will be announced on my Twitter next week! Good luck! T&C's: This giveaway is in collaboration with Mr Kipling. The prize is to win a random selection of Mr Kipling summer cakes and a cherry bakewell inflatable. There is no prize or cash alternative. The prize will be sent directly from Mr Kipling HQ. All entries must be aged 18+ and based in the UK only. Any mandatory fields must be filled out and cheaters will be disqualified from the competition. Ends 11th September 2017. Winner will be announced via my Twitter. They all look amazing! My favourite cake... probably angel cake, so delish! A cupcake with lots of buttercream! Strawberry cheesecake whirls? Oh god this is torture! I am gluten free and I miss Mr Kiplings cakes more than anything else!! My husband is going to be so smug eating these infront of me!! Mine is homemade chocolate fudge cake. Thanks for this lovely giveaway. I love all sponge cake, classic victoria sandwich is delicious! What are you doing to me? I need all of these in my life especially the new strawberries and cream flavour! oooo yummy cake!!!!! These look great my family would have a feast on those that's for sure. I love the cherry bakewells. Cherry Bakewells but I'd happily eat any. I really love Cherry Bakewells. I really like the new packaging, very vibrant, and the Eton Mess Bakewell Tarts sound right up might street! Wow! A definite treat for all the cake lovers out there. My personal favorite are the new Eton Mess Bakewell Tarts. Wew! My favourite is the Angel Slices, so lovely with a nice cup of tea! I love Mr Kiplings Cherry Bakewells. I could happily sit down with all of those and a cup of tea right now.